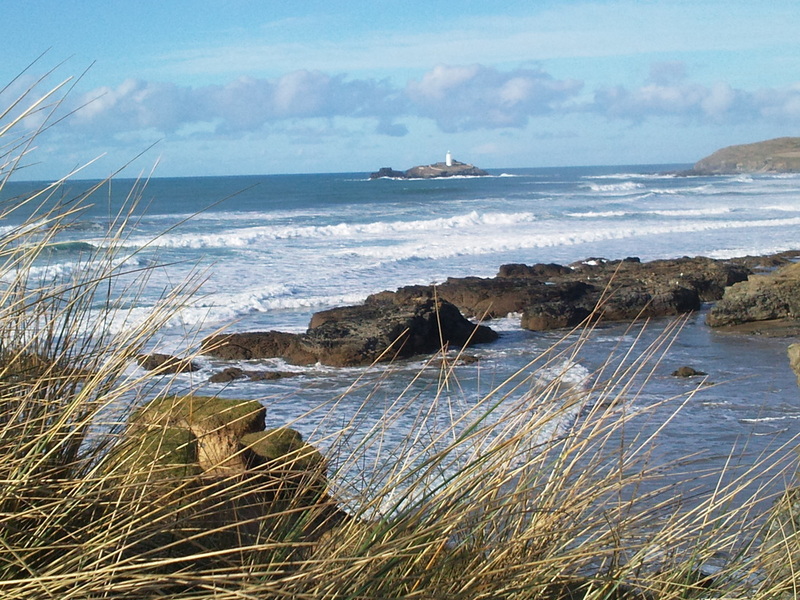 The Best Winter in Cornwall Ever? I’m sitting on the train, heading off to compete on the PKRA Wave Tour leaving behind a sunny but calm Cornwall. After the freezing start to the winter, with snow and arctic winds, the south westerly’s came back on Boxing Day with classic conditions and it pumped for 2 whole months straight. With the swell not dropping below 10ft and regularly above 20 feet @ 16 secs which is bigger than it was in Hawaii for most of the winter! With such big swell running, a lot of the time, it was a case of finding a spot sheltered enough to handle the size as quadruple overhead close outs are not much fun! 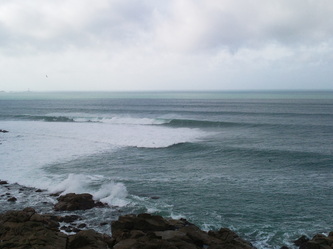 Luckily enough Cornwall has such a range of spots, that you can always find a good wave and when its huge, the rarer more secret spots turn on, producing heaving barrels without the crowds. These spots are however tucked away behind cliffs and amongst rocks, leading to super dodgy launches and landings with the kite but the result is well worth it. After kiting or surfing at least 5 days a week (sometimes every day) for the whole of January and February, there are so many epic sessions stored in my memory but unfortunately, most of them were accompanied by grey skies and rain, meaning the photos didn’t come out or the photographers wouldn’t even leave the house! This did mean that I was kiting mostly on my 7 or 5 Rebels which work so well in cross off waves allowing you to lose all power and surf in the pocket. Some of the standout days of the year and right up there on my all time best list were down at the Bluff on Friday 4th and Saturday 5th Feb.
With the forecast of west swell 22ft @ 17secs and 22mph sw wind, I got up early arriving in the car park at first light and was rigging my 7m at 7.30am. A load of guys were down from the east coast, including Rob Sayer and the car park also had a few windsurfers loitering around, looking in awe at quadruple overhead barrels sucking sand as they raced across the sand bar and making funny gests at me running down the beach with a standard surfboard, no straps and a kite. I quickly headed out and after chicken gybing around a few 15 feet walls of white water (thinking glad, I’m not windsurfing! 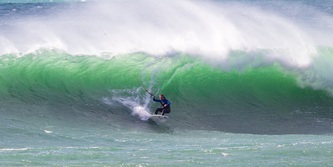 ), I pulled into my first wave, rail grabbing as I came off the bottom, hitting the lip twice before pulling out through the lip as the wave exploded. Over the next 2 hours and with the tide going out, it got heavier and heavier with the sand sucking up off the bottom and leaving a super confused water state between the waves. A couple of windsurfers tried to come out, but didn’t make it leaving it all to myself. 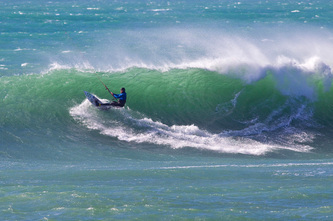 I had a few where I set my line, stalled and pulled under the lip, looking back at wave it was truly amazing with its shape akin to Teahupoo or some far away wave your dreams are made of. With the tide getting too low and the wave closing out, I headed in for a Pasty and to recharge the batteries, ready for the afternoon. 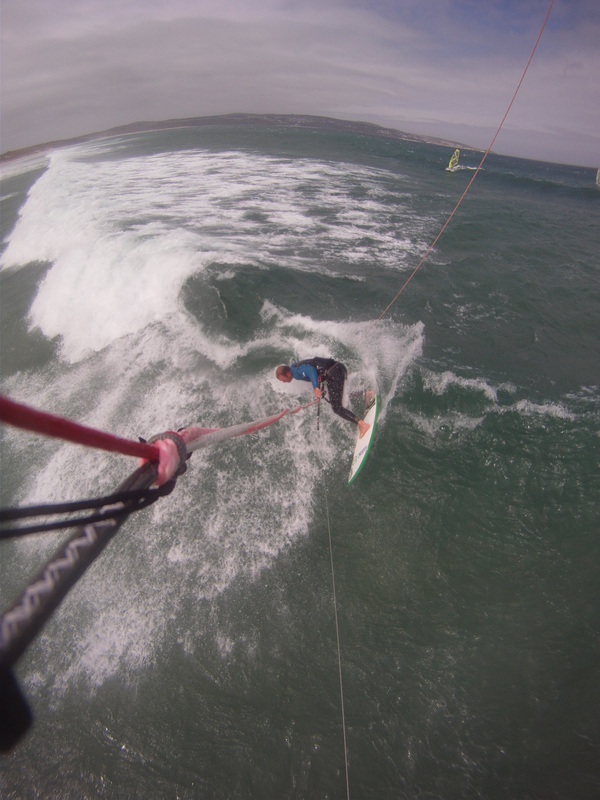 Word had got out, and the pm session was super busy with, Will, Sillsy, Stubbie plus loads of others kiting and around 30 windsurfers all fighting for the set waves as the size had dropped out of it, becoming more manageable at around double overhead. With all these people, there was bound to be some tension between the windsurfers and kiters, and it turned being Blackie who squared up to Sillsy, saying ‘do you not know who I am!’ Still a minor incident and no harm done after Sillsy dropped his kite, right in front of Blackie as he was floating out on his windsurf and shown his frustration our spot being so busy. The next day, I again got up at first light in the hope that it would be pumping again and still quiet? 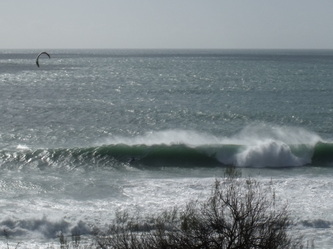 I was right and although not quite as big as Big Friday, it was still triple overhead and grinding again. Heading out by myself on the 7 Rebel again, I dropped into my first couple, getting slotted and spat out, smacking a big turn on the end section. 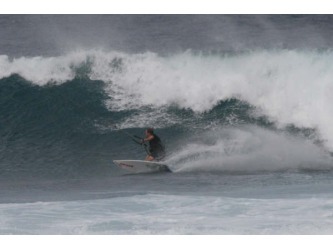 On my 4th wave instead of stalling for the barrel, I came up to hit the lip. Timing it a millisecond too late, I hit the lip of the wave as it was pitching which threw the board straight into my face. I instantly tasted blood, but managed to keep my kite in the air, knowing it would be a right off if these waves exploded onto it. Coming up I quickly jumped back on my board with blood pouring off my face, I headed out back feeling around checking all my teeth were still in place (luckily I don’t use straps as it would of blown my knee out for sure!). By now Rob and another guy were out, so I waved him down and got him to have a quick look. He said it looked ok, just a cut under my nose, so I stayed out for another couple of hours until the tide got too low. Coming in and on closer inspection, I had a big hole under my nose, so off I was to Hospital for a gluing. The afternoon session saw all the guys down at Mexico’s for a good session, which gave many of them the ride of their lives. Still I had had the best of it and as good as it gets at the Bluff for 2 mornings in a row, and Tara was happy as she had me all to herself for an afternoon and a whole Sunday. 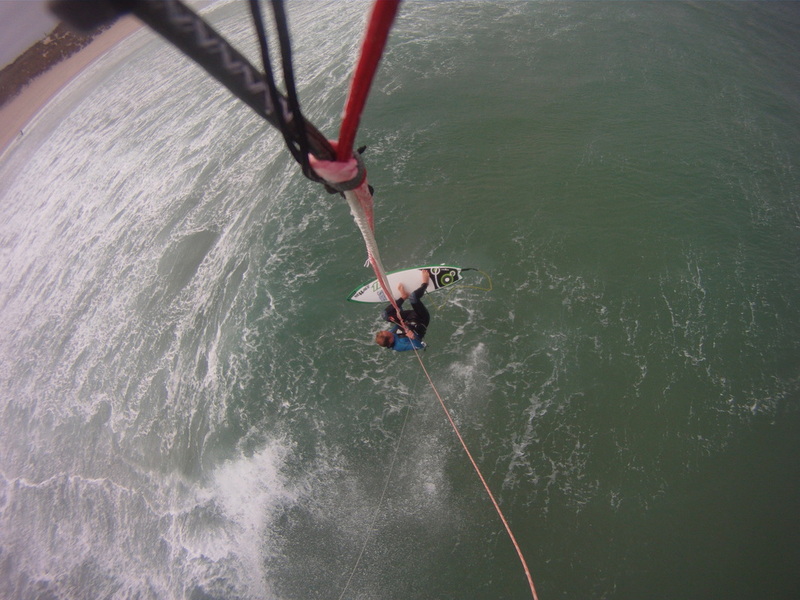 5 days the nurse said I was to stay off the water; well I managed 3 before I was back on the kite again! 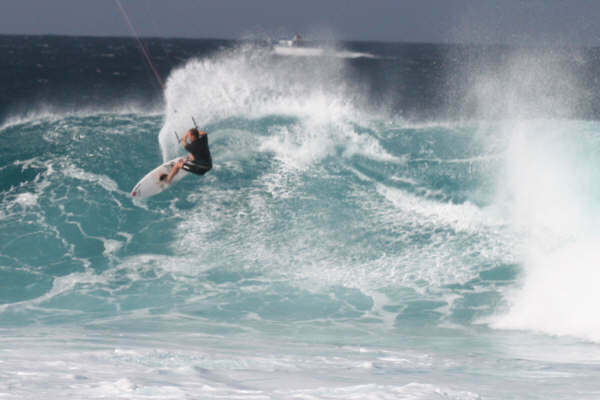 Epic surf days were mixed in with good kites and some frustrating ones where the wind was real puffy making it tricky to ride down the line. One notable surf session was at Leven, 8ft and only 6 guys out. Sillsy and myself ended up surfing the left at Wrestles as the right was being evil, slamming you onto the reef and injuring Skindogs thigh. A few days later with the swell still pumping it all came together for my best session ever. 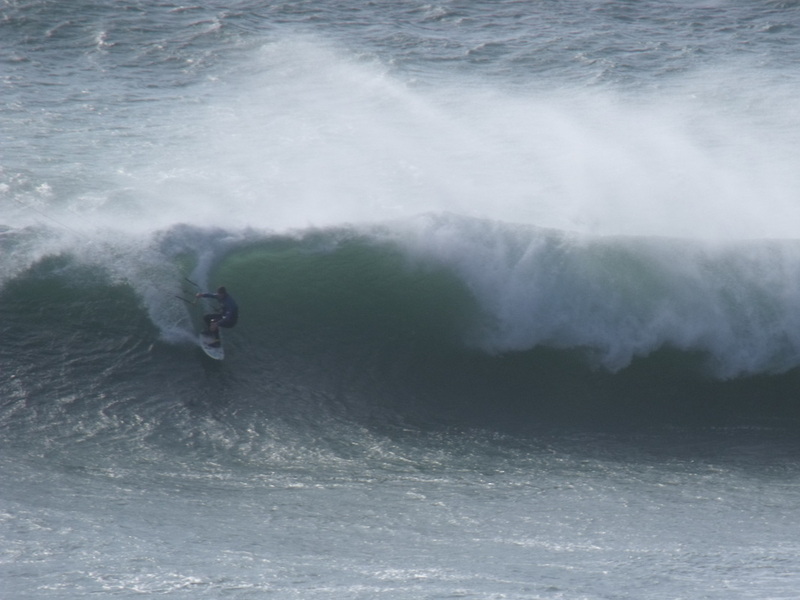 Cross off winds and neap tides meant I could kite Leven while the wave was sheltered by the cliff and get deep in the pit on some bombs. Yet again I was on my favourite kite, Rebel 7 and my 6’3 Tokoro pin tail. Blackie was out windsurfing as I rigged up and launched off the rocks in the wind shadow of the harbour. Quickly making it upwind I lined up deep and pulled in stalling as much as I could, trying for a deep tube ride. The wave was breaking really fast and with the offshore wind was making it hard to kill enough speed to get under the lip. Soon after Blackie got took out and dragged over the rocks breaking something so he headed in and yet again I was by myself in pumping conditions. Getting used to the speed I started coming in behind the peak, way deeper tan where you take off surfing and managed to get under a few. 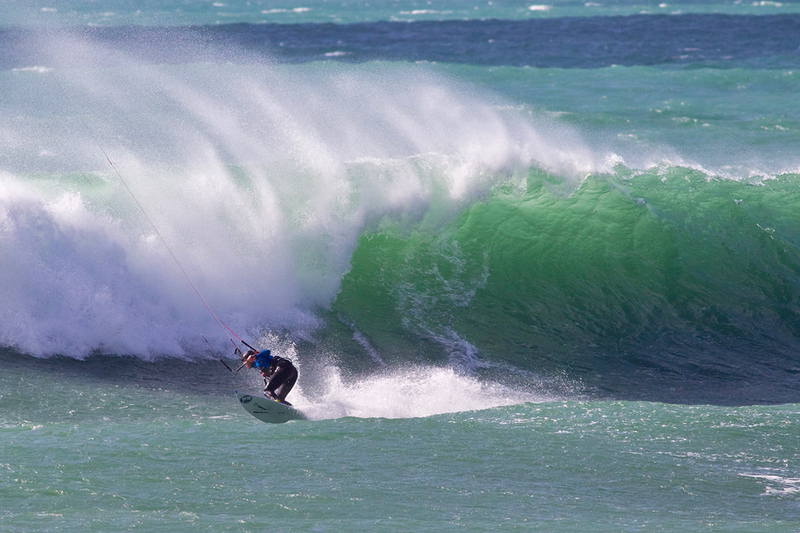 With the sun shining for a change and pumping double overhead plus waves, this top off an end to an amazing spell of kiting here in Cornwall. Remember to always know your limits, wear a leash and be careful in big seas as Debbie Kennedy found out with a scary swim at the Bluff even though she didn’t venture out back. Ask yourself a question when it’s big; ‘can I swim in that’? If the answer is no, then don’t go out! 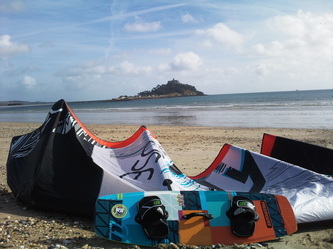 www.pastyadventures.co.uk West Cornwalls only BKSA recognised Kitesurf school teaching at Gwithian and Marazion. 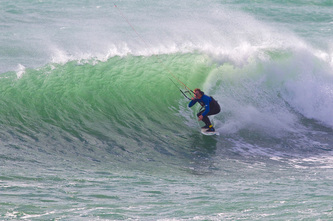 www.kernowkitesurfclub.co.uk for all the info on kitesurfing in Cornwall. 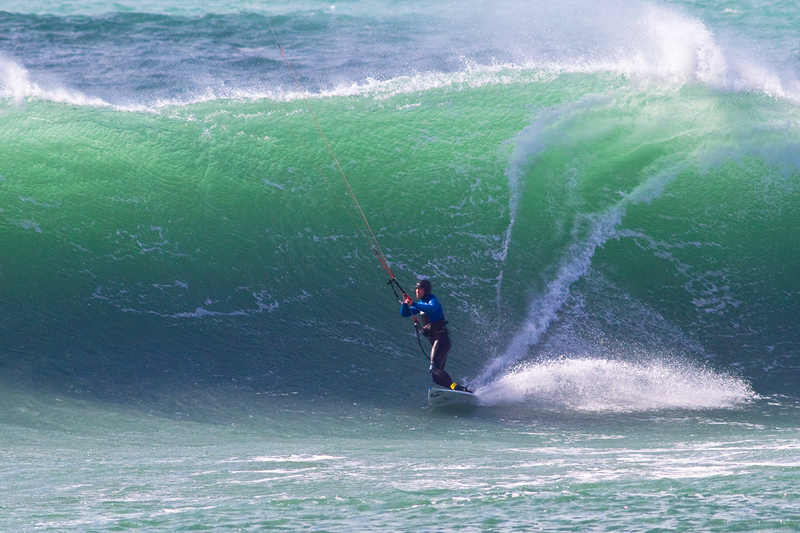 After 3 years of discussions, meetings and knockbacks, kitesurfing is finally allowed back at The Bluff, Hayle Rivermouth in Cornwall. Kernow Kitesurf Club and the British Kite Surfing Association have spent the past 3 years trying to resolve the ban and regain access to one of the best flat water kite spots in the UK. On June 1st the banned signs were taken down and KKC Chairman, Lee Harvey received the first Bluff Pass from new Hayle Harbour Master, Mark Capon. 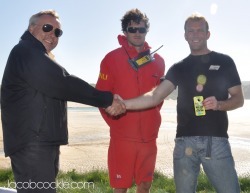 Initially on a 6 month trial, there is a Code of Conduct in place, which must be signed by every kiter when purchasing a ‘Bluff Pass’ which must be worn on their harness while on the water. To be able to ride within the jurisdiction of Hayle Harbour Authority you must adhere to the Code, hold valid insurance and be a member of the BKSA. Failure to comply with this will result in a fine of up to £1000 and more importantly, lead to a return of an outright ban and forsake all of the hard work put in by the club. Passes are £5 for KKC members, £10 for BKSA only and run yearly to the 1st April. 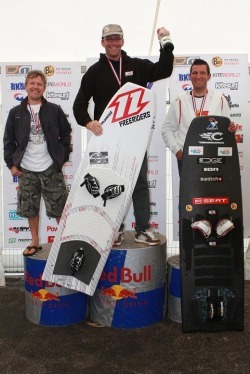 Kernow Kitesurf Club Dominate BKSA Course Racing in Blackpool! Over the Saturday and Sunday of the August bank holiday weekend Kernow Kitesurf Club chairman Lee Harvey (St Ives) and St Austell rep Denzil Williams travelled to Blackpool for the British Kitesurfing Association Course Racing Championships, Round 2. The newest form of competitive kitesurfing sees riders competing on a triangular course with a start line much in the same way as sailing races only at much higher speeds. 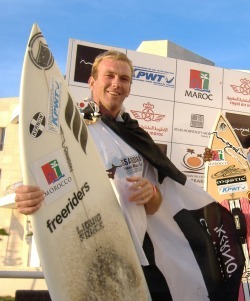 Cornish kitesurfer, Lee Harvey, pictured in Morrocco where he placed 5th in the final round of the 2008 Kiteboard Pro World Tour, Wave Masters. After four rounds throughout the year in; France, Portugal, Brasil and Morrocco, Lee finished his first year on tour in 7th position. With the final round attracting the best riders in the world and the gods delivering 2 days of near perfect double overhead conditions with sideshore winds. Out of an entrance of 42, Lee along with team mate, Will Bennet from Watergate, were the only ones riding with no footstraps on normal surfboards, despite mutterings of, ‘they are crazy guys’ from the strapped contingent. Lee narrowly lost to 2007 World champ Abel Lago (Spain) missing out on his chance for a podium in the quarter finals. 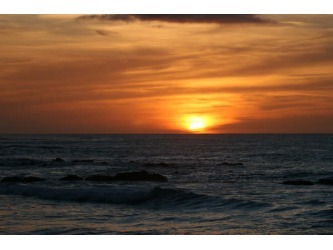 Cape Verde More than just Ponta Preta! With most of the windy and wavey winter locations I have visited being lefts, I thought for my getaway in 2008 I would head for some rights! As a couple of my friends had recently moved to Cape Verde where they are importing South African wine, it was perfect for me to score the world class right hander of Ponta Preta. 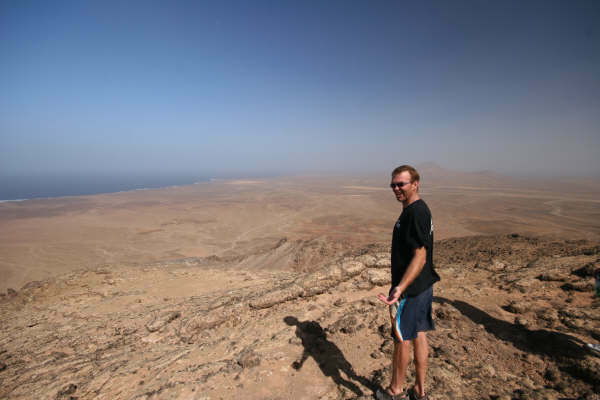 With a big swell forecasted for a few days after my arrival, I had time to check out the area and acclimatise to the wind and dust that is ever present on the island of Sal. On Wednesday with light winds, I went for a stroll along the sand dunes to check out Ponta Preta in anticipation of what was to hopefully at the end of the week. To my surprise as I peered through the haze, it was breaking and what looked to be pretty nice. Running back to the flat to grab my board I ended up scoring a hour and half surfing 4ft Ponta Preta all on my lonesome(never rely solely on the net! ), before darkness won and I could no longer see the throwing lip. With it flat again on Thursday we spent the day scouring the far north of the island, in the hope that there was a wave somewhere? 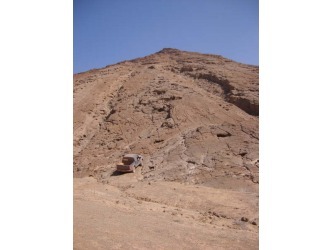 Going as far as scaling an extinct volcano to get the best view, but alas no luck. With all eyes on Friday and the forecasted 17.5ft 16 sec swell. Early to bed with no drinking and rising at 6a.m, I couldn’t believe it was still dark . 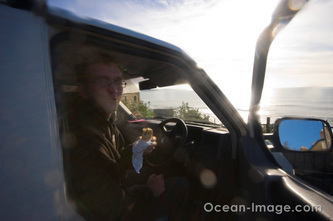 We loaded the 4x4 and headed to Ponta Preta to catch first light and hopefully first set of the day. Turning up to a small, close to the rocks 2 ft and after watching for 30 mins only 2 sets, we soon realised the swell was too northerly in direction to wrap into the classic point break, so the call was made to head north. Coming over the middle of the island we were amped to see masses of white water and as we sped off road, clean lines all the way to the horizon. Checking several spots on the way, we soon came upon Curral Joul, the meanest, heaviest wave on Sal, with no where to launch or land and a spot you would definitely wreck all your gear if you ended up on the rocks! 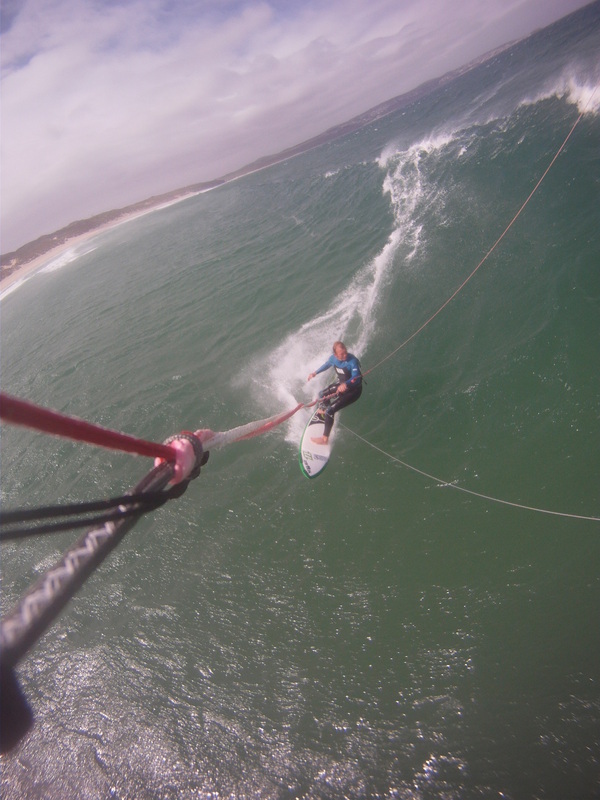 With it blowing cross off 20-25knts and 6-8ft we sped as fast as we could 2kms upwind to the nearest beach where, I quickly pumped up my 7 Vapor, while my mate Phil rigged his 5m windsurf kit. Grabbing my Converse 6’0 we were soon out on the water and in amongst it before 9am. With the superior downwind speed of the kite, I got into at least 10 waves before Phil turned up dropping into a mast high set, only to get clipped by the end barrel section and be washed straight over the rocks (luckily escaping with only a couple of cuts, about 10 spinys and a few holes in his board), leaving me out for the next 2 hours by myself, hitting big turns and pulling into the end offshore barrel section. After wondering where the car had gone and getting slightly cold I started to slog back upwind, only to find Phil (on his smaller board) coming towards me shouting ‘Lets have it!’, so about turn and another hour of joy, with the sets now over mast high, I was in my element and now enjoying it that little bit more with someone to call into the sets! With the wind now howling and going more and more offshore we called it lunch and sailed the 21/2 kms downwind to land at the next beach. Heading back to Santa Maria for lunch via Ponta Preta, we were pleased to find we had made the right call, with a load of windsurfers, 10 kiters and 6 surfers all fighting for the 2 wave sets coming through every 20 mins and with the wind almost dead offshore we still managed to see 2 windsurfers on the rocks and almost a fight between an irate surfer and a kiter, all in a quick hour! 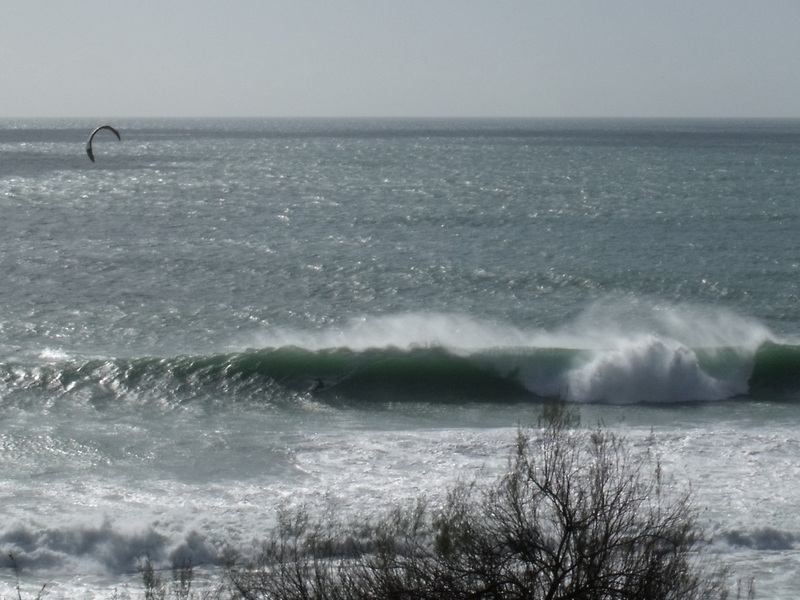 For the afternoon, with the wind now more easterly we snuck in a cheeky sesh with a few others, at the fun but not life threatening spot of Caletta Funda. Still on the 7 Vapor, with the wave being much softer and the launch and land spot being easily accessible, I enjoyed a couple of hours strapless smashing the tops off some nice sections before grabbing the 6’0 again to play around hitting some wave rolls and airs off the middle section. Smiling and knackered it was early to bed. 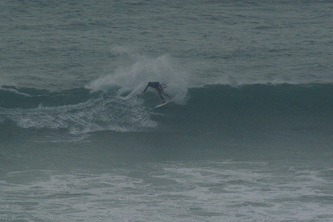 Rising early on Saturday, 6.30a.m at Ponta Preta, again saw the same inconsistency, but it was slightly bigger! Curral Joul it was again then and speeding past Ali Baba, we were looking at a lot more swell than the day before. I was praying for something special! Pulling up in front of the rocks we found it more off shore, bigger and meaner than the previous day. Not wanting to be caught out there by myself, I spent the next 5 mins persuading Phil that he was keen, and let’s go rig up now! 7m again and on the water before 8am, I didn’t want to hold back and sped downwind straight into a boiling pit, where I soon noticed how much racier and faster the waves were than the day before. Hitting some meaty turns on the first 2 sections I was a bit anxious to pull into the now Thick Lipped end barrel section, whilst out there all alone, with no ski or chance of rescue. After half an hour and with the wind picking up a notch Phil turned up, dropping into a mast high bomb and this time making out. Amped to no longer be alone, on the next few sets I pulled in as deep as possible busting some awesome turns and making some deep end barrels, but with some of the larger sets closing out, I found myself pulling out of a few as only a kite surfer can, High Altitude. Getting more and more confident, I started pulling off less and less, instead just pulling in and backdooring some crazy pits until, a gust caught me whilst in the barrel and sent me flying, minus board out through the lip, board stuck in the lip, I was lucky it didn’t take my head off as it was finally projectiled towards me, leash now 3 times the length, and worst still the kite was now falling out of the sky! 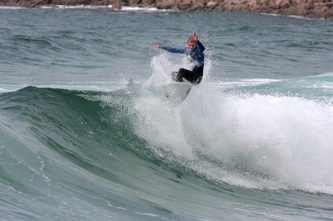 Luckily I was on the last wave of the set and managed to quickly re-launch to make it out back for a short breather. With a random windsurfer sailing up from downwind and sitting out the back, I approached to see if he was ok to hear, ‘Just watching you guys drop into those massive bombs, from up close’? 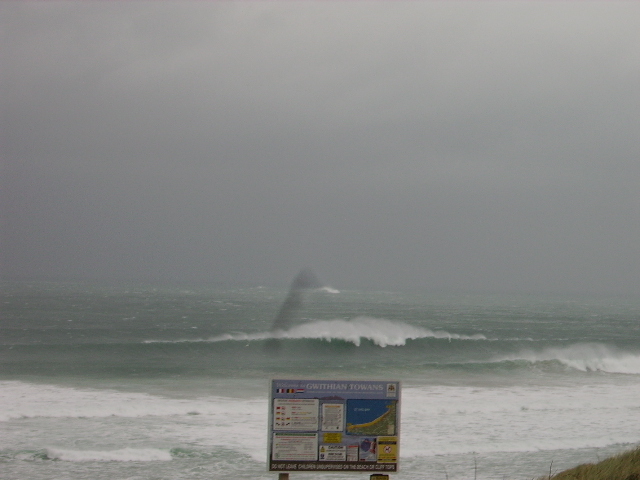 We enjoyed another half hour before at about 11.30 the wind started to switch more offshore and drop. We decided to call it a day to make sure we could get back in at the now dead offshore landing sight. Lunch via a Ponta Preta check again, to see Mitu pull in and get barrelled on both rideable waves of the only 2 sets in an hour, all hands voted- for the afternoon we were heading north again! Coming off the main road we could now see swell lines all the way to the horizon, we thought YES we’re in luck for another cracking session, however when we got through the dust to the coast it was dead off shore and only around 15knts. 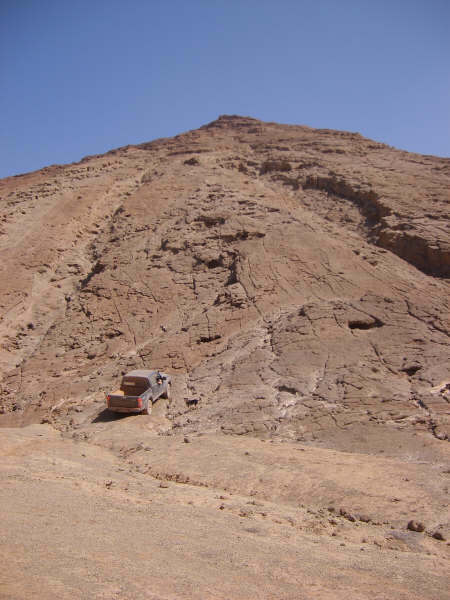 Approaching Ali Baba, there was no way I could drive past those big barrels and to my amazement, no one out! The next few hours were heaven, getting slotted on the surfboard and being joined only by, one sponger and one other surfer after an hour and half. Needless to say I was out till dark, when to top off an excellent couple of days – The first sunset I had seen (due to dust) since leaving good old Kernow. The Beers were then a flowing, with some awesome funky dancing around the bars of Santa Maria! 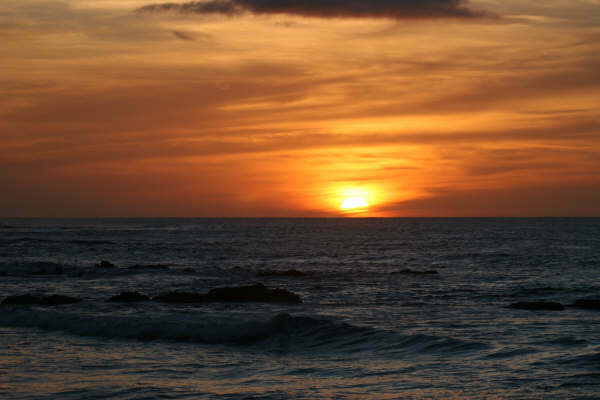 Cape Verde is truly an awesome place, but remember there is more to it than just Ponta Preta! For my next visit I’m going to explore the other islands where there are virgin waves just waiting to be kited! Thanks to capeverdeimports.com, flystar.com, Phil & Vicky, Tigs, Charlie, Trevor & Jackie, lucky mascot ‘Mum the dog’ and the local watermen of Sal for making a memorable trip. 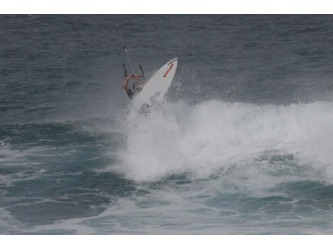 Thanks to my sponsors – Airush, Freeriders, West for all their support.